See something, say something… but to whom? Law enforcement agencies are always telling the community that it is their duty to say something when they see something, urging them to become snitches for free, but when someone does do the right thing and says something, they all pass the buck, either because they are afraid of the consequences or because they are too lazy to take action. 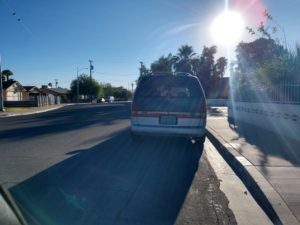 Just this week a resident of Ward One reported a van parked in front of his home for several days and every city employee started passing the buck. Parking Enforcement almost duplicated the arrogant attitude of Code Enforcement or worse, because the woman who claimed her name is Melissa refused to transfer the call to a Parking Enforcement Officer, and when the Ward One resident finally got to talk to an alleged supervisor who said her name was Evelyn Valdez, she referred the call to another department that knew nothing about how to handle a situation like that and abruptly terminated the call. The sixty-five-year resident of the city of Las Vegas trying to be a positive citizen, frustrated, called the Las Vegas Metropolitan Police Department’s non-emergency number, and the rude telephone operator told the caller that he needed to provide the plate number of the car, which the caller did not have, until our Las Vegas Tribune reporter drove all the way across the city and took a photo of the suspicious van. A telephone call by the newspaper to Ward One Councilwoman Lois Tarkanian was answered, as always, with a recorded message and no one from the Ward One Councilwoman’s office ever returned the telephone call asking for a comment on what a citizen should do when they see something and did say something and is then given the runaround. “Events like this one make people lose interest in being part of the community and acting like a member of the community by seeing something and saying something because passing the buck is not protecting each other and is not protecting our community,” said the newspaper’s founder, Rolando Larraz. suspicious. Dispatcher Madi must not have liked what the man on the other end of the line was saying because she rudely and without a word terminated the call.